Big Bud has been extensively researched, developed and field-tested. Big Bud will dramatically increase fruit/flower growth, width, weight and production like no other bloom enhancing product can. Big Bud was engineered by Dr. Hornby, one of the worlds leading authorities on fertilizer and amino acid uptake of plants. 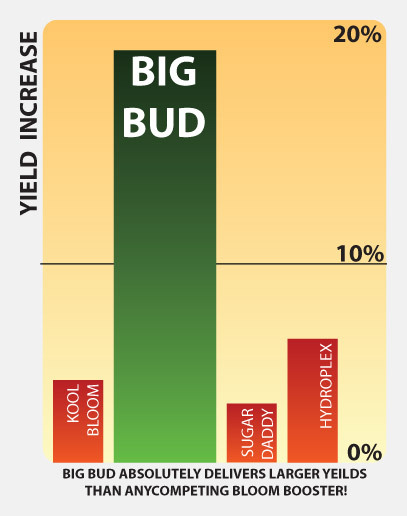 Big Bud was engineered as a high Potassium to Phosphorus ratio fertilizer that is coupled with superior amino acids (28 to be exact). Contains biocatalysts, amino acids, ascorbic acids and the proper amount of chelated magnesium. This product will help grow a large, strong frame, with more flowering sites than your eyes will believe. Contains absolutely no dyes. Step 2 for insanely large yields. **IMPORTANT** Final Phase your plants at the end of the late fruit/flowering cycle. Big Bud has been extensively researched, developed and field-tested. Big Bud will dramatically increase fruit/flower growth, width, weight and production like no other bloom enhancing product can. Big Bud was engineered by Dr. Hornby, one of the worlds leading authorities on fertilizer and amino acid uptake of plants. ..